Many media outlets compare the contemporary situation in Europe with the days before WWII. I would like to make an important correction here. Now we are watching the West fostering another Nazi regime represented by Kiev junta and it makes remember the second half of the 1930s when it did the very same thing cooperating with Germany turned into a fascist state. Of course, the Ukraine we know today cannot measure up to Hitler’s Germany. But the first blow is half the battle. The running amok Fuhrer started as an unknown corporal preaching xenophobia and revenge. It’s an open secret that Adolf Hitler was supported by the United States. The US penetration was significant, especially its cooperation with the German war industry. By 1933 the United States controlled key branches of Germany’s economy, as well as several large banks such as Deutsche Bank, Dresdner Bank, etc. Big business started to trust Hitler. Those were the days of affluence for the National Socialist German Workers’ Party as funds from abroad began to pour in. Thanks to large donations from Fritz Thyssen’s group including the United Steelworks (Vereinigte Stahlwerke AG), I.G. Farbenindustrie AG (Interessen-Gemeinschaft Farbenindustrie AG) and mining industry tycoon Emil Kirdorf the party received 6,4 million votes to become the second largest in the Reichstag (parliament). Hjalmar Schacht (22 January 1877 – 3 June 1970), a German economist, banker, liberal politician, and co-founder in 1918 of the German Democratic Party, became the key connecting link between German industry and foreign donors. 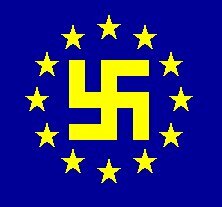 British business and banking interests also started to channel donations to the Nazi party. On January 4, 1932 Montague Norman, the Governor of the Bank of England from 1920 to 1944, met Hitler and German Chancellor Franz von Papen to conclude a secret accord on providing funds for the National Socialist German Workers’ Party. The US was also represented at this meeting. Both Dulles brothers were present. Western historians shy away from mentioning the fact. John Foster Dulles and Allen Dulles were politically connected Wall Street lawyers, servants of corporate power, who led the United States into an unseen war that decisively shaped today’s world. It is worth noting, that during the 1950s, when the Cold War was at its peak, the two immensely powerful Dulles brothers led the United States into a series of foreign adventures whose effects are still shaking the world. John Foster Dulles was Secretary of State while his brother, Allen Dulles, was director of the Central Intelligence Agency (CIA). Federal elections were held in Germany on 5 March 1933. As a result of lavish donations coming in from abroad, the ruling Nazi Party led by Adolf Hitler, who was appointed Chancellor on January 30, 1933, registered a large increase in votes emerging as the largest party by far. Nevertheless they failed to obtain an absolute majority in their own right and needed the votes of their coalition partner, the German National People’s Party (DNVP), for a Reichstag majority. The new German government was treated extremely favorably by US and UK ruling circles. Western democracies kept silent when Berlin refused to pay reparations. Hjalmar Schacht, President of the Reichsbank and Minister of Economics, went to the United States in May 1933 to meet President Franklin Delano Roosevelt and leading Wall Street bankers. Germany was granted a $1 billion credit. And in June, during a visit to Norman in London, Schacht requested an addition $2 billion in loans as well as a reduction and eventual cessation of payment on old loans. Thus, the Nazis got something that the previous government could not. In the summer of 1934, Britain signed the Anglo-German Transfer Agreement, which became one of the foundations of British policy towards the Third Reich, and by the end of the 1930′s, Germany developed into Britain’s primary trading partner. Schroeder’s bank turned into Germany and Great Britain’s main agent, and in 1936, its New York branch merged with a Rockefeller holding to create the investment bank «Schroeder, Rockefeller and Co.», which the New York Times described as «economic-propagandist axis of Berlin-Rome». The ‘Secret Memorandum’ was issued by Adolf Hitler in August 1936. The memorandum went out only to a few senior Nazi leaders and its contents – information about the Four-Year Plan – was formally announced to the party’s faithful in September 1936 at the party rally in Nuremberg. The Secret Memorandum stated that in four years Germany was to develop capable combat-ready armed forces and its economy was to be mobilized to meet the needs of war. As he admitted to himself, Hitler viewed foreign credit as the financial basis for his four-year plan, so this didn’t raise the slightest alarm. In August 1934, American oil giant Standard Oil purchased 730,000 acres of land in Germany and built large oil refineries that supplied the Nazis with oil. At the same time, the United States secretly provided Germany with the most modern equipment for its airplane factories, which were slated to produce Germany’s military aircraft. In turn, Germany received a large number of patents from several American companies including Pratt and Whitney, Douglas, and the Bendix Corporation, and the “Junkers-87” dive-bomber was built using purely American technology. As the war broke out, the monopolies stuck to the good old tried-and-true rule – nothing personal, only business. By 1941, when the Second World War was in full swing, American investment in the German economy totaled $475 million: Standard Oil invested $120 million alone, General Motors — $35 million, ITT — $30 million, and Ford — $17.5 million. What motivated the interest of Western business in the growing might of Nazi Germany? The goal was to direct Hitler to the East involving a German invasion of Russia. The conquest of Lebensraum («living space») was for Hitler and the rest of the National Socialists the most important German foreign policy goal. At his first meeting with the leading Generals and Admirals of the Reich («Empire») on February 3, 1933, Hitler spoke of “conquest of Lebensraum” in the East and ruthless ‘Germanization’ as his two ultimate foreign policy objectives. For Hitler, the land which would provide sufficient Lebensraum for Germany was the Soviet Union, which in Hitler eyes was both a nation that possessed vast and rich agricultural land and was inhabited by what Hitler considered as Slavic Untermenschen (sub-humans) ruled over by what he regarded as a gang of blood-thirsty, but grossly incompetent “Jewish revolutionaries”. These people were not “Germanizable” in his eyes; only the soil was. In turn, the policy of appeasement was implemented by Western countries in the 1930s against a background of financial and economic cooperation of Anglo-American business interests with Nazi Germany. In October 1930, Germany withdrew from both the Conference for the Reduction and Limitation of Armaments of 1932–1934 (sometimes named the World Disarmament Conference or Geneva Disarmament Conference) and the League of Nations. In March 1936, Hitler ordered his troops to openly re-enter the Rhineland which had been demilitarized under the Versailles Treaty. In March 1938 Austria was annexed. The West did not react. Fall Grün (Operation Green), a German military plan to occupy Czechoslovakia, was approved by Hitler in December 1937. The execution of Operation Green was called off after the Munich Pact was concluded between England, France, Italy and Nazi Germany on September 30, 1938. While Hitler signed the Munich agreement along with Arthur Neville Chamberlain, Édouard Daladier and Benito Mussolini, the operation to invade Czechoslovakia prevailed. On October 21 he ordered to start preparations for the military annexation of the rest of Czechoslovakia and the Klaipeda Region (also known as the Memel Territory) which had been part of Lithuania since 1923. In March 1939, Germany delivered an ultimatum to Poland demanding renegotiation of the Danzig agreement. The Polish Corridor (also known as Danzig Corridor, Corridor to the Sea or Gdansk Corridor) was a territory located in the region of Pomerelia (eastern Pomerania, formerly part of West Prussia), which provided the Second Republic of Poland (1920–1939) with access to the Baltic Sea, thus dividing the bulk of Germany from the province of East Prussia. The Free city of Danzig (now the Polish city of Gdansk) was separate from both Poland and Germany. But Memel and Danzig were not the ultimate goal of Nazi Germany. Adolph Hitler was fully aware that nobody in the West had any intention to stand in his way. On April 1939 he secretly ordered Poland to be attacked on September 1. With the seizure of Czechoslovakia, Hitler’s duel-track policy was an open secret even for the most shortsighted politicians and diplomats. The Soviet Union still cherished hope to build a collective system of security in Europe. It managed to make London and Paris start talks on creating a really effective alliance to counter the aggressor. But these talks were to reveal that the Western partners were reluctant to hinder Hitler’s expansionary policy to the East. Sir Alexander Cadogan (Permanent Under-Secretary at the Foreign Office) cited Chamberlain saying he would rather resign the premiership than conclude an agreement with the Soviets. When Germany attacked Poland and the Second World War started, Western leaders pointed their finger at both the Soviet Union and Germany which signed the Non-Aggression Pact of August 23, 1939. Supported by a choir of propaganda, they said it was not the Western appeasement policy, but rather the USSR-Germany Non-Aggression Pact which triggered the war. In the wake of World War II, neither London, nor Washington, nor Paris want to hear the truth about these historical events. They signed the Nuremberg Trial verdict that found Germany guilty of grave crimes and violations of international law and the laws of war, without acknowledging who was behind Nazi Germany? The political and financial elites of the United States, Great Britain and France were directly involved in fostering Nazi regime. They incited Hitler to move east. The West has never recognized its responsibility for supporting Hitler’s regime. In today’s context, it has does its utmost to prevent Russia’s return on the world stage as a leading actor. Today it is fostering the ulcer of Nazism and xenophobia emerging right in front of our very eyes. To hide the truth it circulates the Washington-invented and Europe-inculcated story about “Russian aggression” against Ukraine. Russia is demonized and provoked into direct confrontation with a view to triggering its involvement in Ukraine’s internal conflict. While the Kiev junta is not “in the same league” as Germany’s Nazi regime, history shows that the ulcer of Nazism combined with the thrust of Russophobia is gaining momentum. And sooner or later it may be beyond the control of those who encouraged it in the first place. The slogan “Ukraine above all” sounds very much like a remake of Nazi Germany’s “Deutschland über alles”, (Germany above all). “Ukraine above all” is being used to justify the crimes committed by Ukraine forces in Novorossiya.